Trump Prepares Mass Deportations: We Must Resist, March, Blockade, and Strike! Just weeks into his inauguration, Trump’s Immigration and Customs Enforcement (ICE) agency carried out a multi-state sweep of over 700 undocumented immigrants in a matter of days. Ominous Department of Homeland Security (DHS) memos have been released indicating a zealous drive to create a crushing momentum in ramping up the deportation machine. They plan to hire 10,000 Immigration officers and 5,000 border patrol agents. The administration seeks to “to publicize crimes by undocumented immigrants; strip such immigrants of privacy protections; enlist local police officers as enforcers; erect new detention facilities; discourage asylum seekers; and, ultimately, speed up deportations” (NYTimes, 2/21/2017). The DHS memos further indicate dramatically expanding the definition of “removable aliens” and those subject to expedited deportation, including skipping the right to deportation hearings. This used to apply to immigrants in the country less than 14 days and now they want to expand it to two years. The memos set a directive to include not just serious crimes as a trigger for deportation, but even low level chargeable offenses like driving without a license and the very fact of being in the U.S. without documents. The memos suggest even going so far as targeting immigrants with green cards or other visas as well as prosecuting parents who arrange for their children to be brought over. Programs like Secure Communities, which force local jails to send fingerprint data of arrestees to ICE databases (Washington Post, 10/1/2010), as well as the 287(G) program, which deputizes local law enforcement agents in as immigration officers, are to be revived and expanded. This also includes the E-Verify program which is a rapid automated check of immigration status when workers apply for jobs. Perhaps the most provocative of all is discussions around mobilizing 100,000 National Guard troops as deportation agents. The White House denies that this is settled policy but the leaked memo from DHS Secretary John Kelly leaves no doubt that it’s at least getting serious consideration. Much of this rapid escalation by the Trump administration is possible because the entire framework for it had already been set by the Bush and especially the Obama administrations. As Cesar Vargas, co-director of DREAM Action Coalition in NY said “we are seeing Donald Trump taking the keys of an aggressive deportation machine, that President Obama created, and taking it over 100 miles per hour,” (Democracy Now, 2/22/2017). The Obama administration had the awful record of deporting more immigrants than every other previous administration combined. Carried out under the guise of making “Comprehensive Immigration Reform” more palatable to Republicans who only cared about enforcement and border security, it accomplished nothing except to tear apart families and to return workers to the desolate economies and repressive regimes they escaped from. The scale of injustice this represents only acquires its true height when we realize that the very need for immigrating to the U.S. is created by decades of imperialist trade and economic policy that has ruined economies and democratic freedoms across the world so that U.S. multinational corporations could profit. 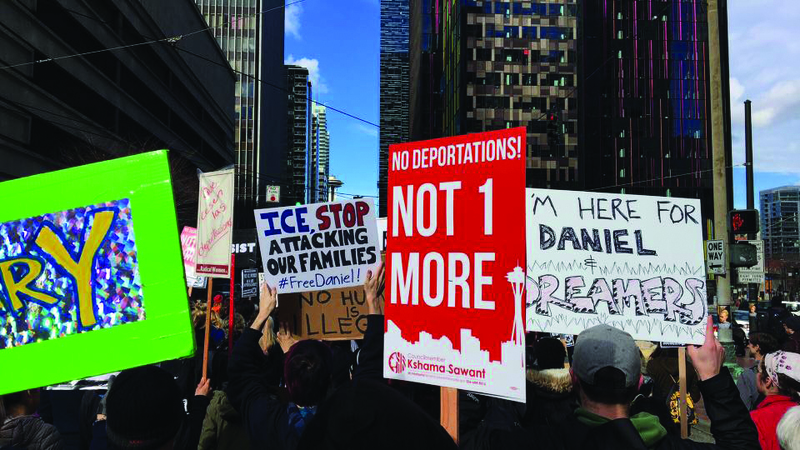 The Trump administration’s vicious mobilization of the deportation machine has created a highly combustible atmosphere of fear, anger, and determination to fight back. We have already seen mass protests against the Muslim ban and escalation to the “Day Without Immigrants and Refugees” on February 16, which, while relatively small in scale, involved many workplace shutdowns across the country and pointed to the potential for far wider actions. All the elements that will bring back struggle for immigrant rights on the scale of the 2006 marches and strikes of millions are in motion. Sensing the boiling flame of subterranean fire in support of immigrant rights and the realization that this time immigrant families will not be alone in the fight, quite a number of Democratic Party politicians are making defiant declarations that their localities will remain sanctuaries for immigrants. They include mayors and police chiefs in Los Angeles, Oakland, Chicago, Minneapolis, New York, San Francisco, and Seattle. Unfortunately, many of these mayors are responding to mass sentiment and making promises they are unprepared to back up. The phrase “Sanctuary City” conjures up a place where immigrants can find refuge and physical protection from ICE agents. Instead, its narrow legal definition says that police and local law enforcement will not act as immigration agents and won’t detain immigrants on behalf of federal authorities, but they will not actually stand in the way of ICE agents detaining and removing people for deportation. If mayors are serious about declaring their cities as sanctuaries, then they need to do much more to create serious obstacles to ICE’s attempts to carry out deportations. They need to choke off the deportation pipeline by ending racist mass incarceration policies and “broken windows” policing. They need to fully commit to safeguarding personal information gathered by city agencies that can be used by ICE to identify targets, even up to destroying records if necessary. Social movements in cities could mobilize mass non-violent civil disobedience to block some of ICE’s activities and mayors could refuse to deploy their police to repress protesters. Trump has threatened to cut off federal funding and lawsuits against sanctuary cities. Cities can fight back by expanding authority to drastically increase taxes on the super rich and big business. Any political figure who sincerely pushes in this direction can be backed up by mass grassroots action. Even exit polls after the November 2016 elections showed that 70% voters believed that “illegal immigrants working in the U.S. should be offered legal status” not deportation (CNN.com, 11/23/2016). We need to build on that and show that a united movement of all workers and youth regardless of legal status can bring down Trump. Millions of immigrants, if organized into unions, could provide a powerful boost that could revive an anemic labor movement. Our own independent mass movements along with organized labor will need to create the firestorm of pressure by mass protests, mass direct actions including blockades and strikes. This May 1, International Workers Day, offers an excellent opportunity to organize for mass strikes wherever possible. We need to make sure our immigrant sisters and brothers do not stand alone. Nothing short of that will stop Trump. We cannot rely on the big-business-controlled Democratic Party. We instead need to build a united, independent, and sustained mass movement against Trump, racism, sexism, homophobia, the billionaire class, and capitalism. This includes building a new party of the 99% with a socialist program that unapologetically defends all those attacked by Trump and goes further to building an enduring mass movement to fight for gains for all working people. An injury to one is an injury to all! All out to defend Muslims, immigrants, women, black people, workers’ rights, and democratic rights. No cooperation with Trump’s deportation machine! For real Sanctuary Cities. End Broken Windows policing. For an escalation of mass protest including strike action on March 8 and May 1 to stop Trump. We call on all mass organizations, especially trade unions, to take the lead and systematically prepare a full mobilization of all people opposed to Trump.